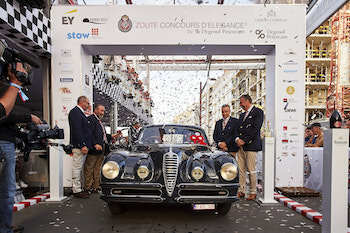 Alfa Romeo came out on top during the centrepiece Concours d'Elégance at last weekend’s Zoute Grand Prix as the "Best of Show" award was handed to a 6C 2500 SS Coupé from 1948 with bodywork by Touring Superleggera. Alfa Romeo came out on top during the centrepiece Concours d'Elégance at last weekend’s Zoute Grand Prix, Belgium’s most prestigious motoring event devoted to vintage to modern cars. The jury, under chairmanship of Mr. Philip Kantor, Head of the Motor Cars Department at Bonhams Europe, bestowed the "Best of Show" award onto an Alfa Romeo 6C 2500 SS Coupé from 1948, with a body created by Touring Superleggera. 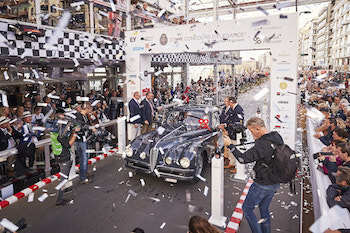 The car was entered into the Concours by collector Johan van Puyvelde, who said the merit of this victory lies in the three main qualities he perceives in his car: the distinctive appearance of the 6C 2500 SS, coachbuilt by Milan's Superleggera in 1948, its chassis, which was originally conceived before World War II and on which Italian pilot Tazio Nuvolari also competed, and finally its unique grey exterior colour that makes it a very distinctive model for its era. The jury in turn also praised the exceptional qualities of the 6C 2500 SS Touring. Alfa Romeo officially attends each edition of Zoute Grand Prix, which is now in its ninth year. It’s the most prestigious modern, classic and vintage car event in Belgium and is organised by seaside. More than 200,000 visitors from Belgium and abroad attended the four days of the event this year. Besides the Concours d'Elégance, there was a rally for vintage cars, the "GT Tour", which was held on the Sunday for the latest supercars to parade, and an auction by Bonhams. All the premium, sports and luxury brands attend the event to display their latest models. Alfa Romeo's Pavilion exhibited the newest models of the range, including the new “B-Tech” special series versions of Giulia and Stelvio, while a vintage 1959 Alfa Romeo Giulietta Spider was also included in the display. The next and tenth edition of the Zoute Grand Prix will take place on 10-13 October 2019.